Over the past 10 months, we have run a number of training camps and days to help the participants prepare for the Jamboree next year. One element we are covering is physical challenges that may present themselves to some upon arrival at the Summit Bechtel Reserve. These challenges revolve around the size and elevation of the Summit itself. The primary mode of transportation throughout the camp is hiking. At 14,000 acres, the Summit is no small area of land. So, you will be doing quite a bit of hiking while at the Jamboree next year. 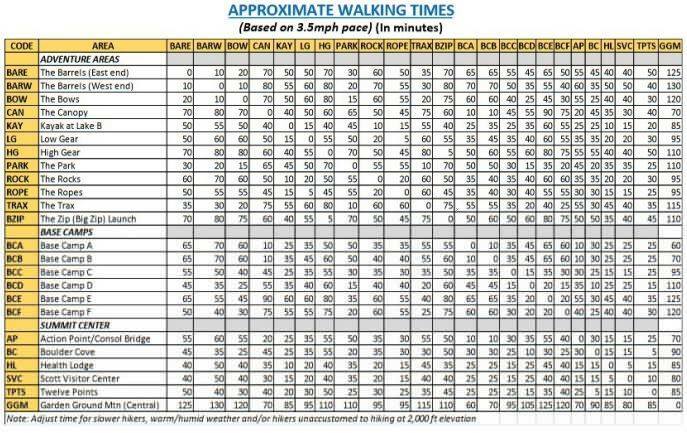 For example, and as shown in the chart below, it can take upwards of two hours to walk between different activities and events across the Summit’s property. As with any High Adventure Base, it is highly recommended to take the time to prepare and train for the strenuous activity that may present itself. In addition, the Summit is at approximately 2,000 feet of elevation. While you most likely won’t have to deal with anything related to altitude sickness, the difference in elevation can make it slightly harder to breath and you may find yourself out of breath much easier than you would at home. General fitness levels will help Scouts acclimatize more quickly, so it’s important that everyone ensures they are in top shape before travelling next year!